This Instant Pot Sweet and Sour Chicken recipe post was sponsored by Ling Ling, all opinions expressed in my post are my own. 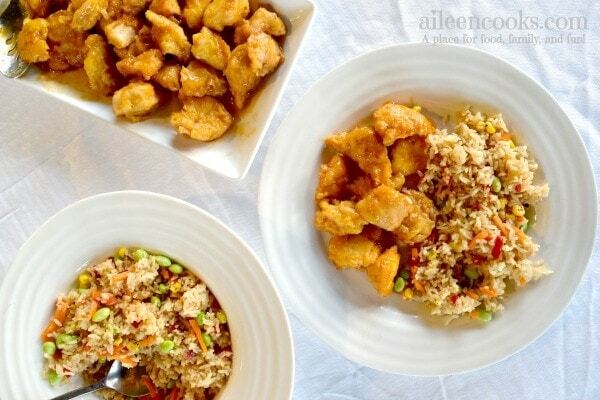 Enjoy delicious Chinese food at home with this recipe for Instant Pot Sweet and Sour Chicken. This recipe tastes just like take-out and it’s ready just as fast, thanks to your handy pressure cooker. I recently went to an event in San Francisco where we made some dishes and crafts in honor of Chinese New Year. It inspired me to celebrate at home with my family and experiment with a new recipe in my instant pot electric pressure cooker. I love instant pot sweet and sour chicken because it’s easy to make, feels fancy, and it’s totally kid-friendly. It’s also an affordable way to get that take-out flavor without having to actually leave the house, plus it costs less money to make it yourself. With 3 hungry kids, eating out can get expensive. I love finding delicious instant pot chicken breast recipes I can make at home that gets me out of my dinner time rut. I like to serve my instant pot sweet and sour chicken with Ling Ling Fried Rice. It’s so easy to prepare and tastes great. I just start my sweet and sour chicken in the instant pot and once it’s started to naturally release pressure, I pop a couple of bags of Fried Rice into the microwave (there are two bags in each box). My kids really love this Fried Rice, so I have learned I need to make both bags. With this meal of instant pot sweet and sour chicken, I served Ling Ling Fried Rice Chinese-Style Vegetable. All of their Fried Fice varieties are delicious. They also offer Yakitori Chicken, Yakiniku Beef, Thai-Style Chicken, and Bibimbap Beef. 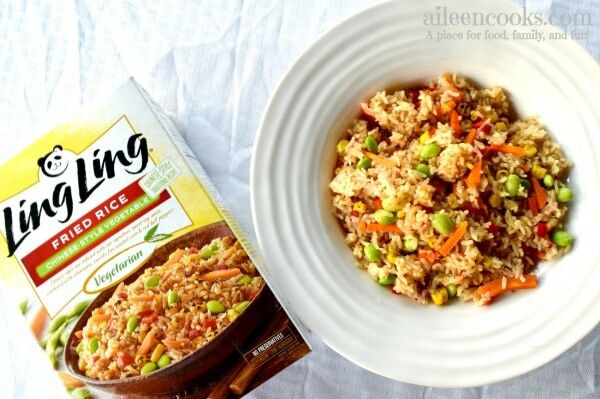 You really can’t go wrong with any of the Ling Ling Fried Rice varieties. As is with their Pot Stickers (a family favorite and freezer staple around here), they consistently offer a high-quality and tasty product. Ling Ling has also come out with a line of Authentic Asian Style Noodles. They are amazing – I highly recommend trying them (and stay tuned for a recipe pairing with them next month). The flavors they offer are Drunken Noodles and Yakisoba Noodles. Ling Ling traveled the Asian continent to bring authentic flavors to our homes. 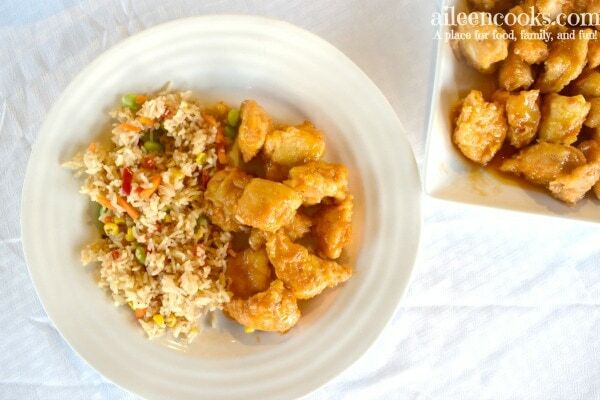 You are going to love the flavors of the fried rice paired with this yummy recipe for instant pot sweet and sour chicken. Okay, on to the recipe for Instant Pot Sweet and Sour Chicken! 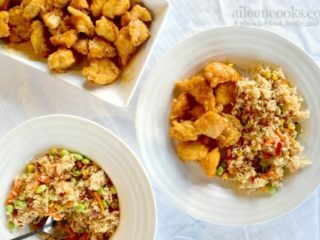 Make take-out Chinese food at home with this yummy (and quick) recipe for Instant Pot Sweet and Sour Chicken. 2 pounds boneless skinless chicken breasts, cut into 1-inch chunks. In a small bowl, whisk together the apple cider vinegar, sugar, ketchup, soy sauce, garlic powder, and salt. Set aside. Pour the cornstarch into a gallon sized zip top bag. Season chicken with salt and pepper and place inside the bag of cornstarch. Close the bag and shake until the chicken is coated evenly. Set your Instant Pot or another electric pressure cooker to saute. Pour in oil and wait until it is hot (if using an Instant Pot, it will say "hot"). Working in batches, remove the chicken pieces from the bag, tap off any excess cornstarch, and dredge in the beaten eggs. Shake again to remove any access egg and place in the hot oil. Continue until the chicken is an even layer on the bottom of the pot. Let cook, unmoved for 30 seconds. Remove from the pot and continue with the rest of the chicken. Once all of the chicken is lightly browned, pour in the sauce mixture and deglaze the bottom of your pot (mix and scrape off any cooked bits of food stuck to the bottom or sides of your pot). Add the chicken and turn to coat with the sauce. Natural Pressure Release for a minimum of 10 minutes. While your sweet and sour chicken has finished cooking and is on NPR, prepare the Ling Ling Fried Rice> I like to use the microwave, but you can also cook it on the stove top. Serve the chicken and rice hot. Refrigerate any leftovers. 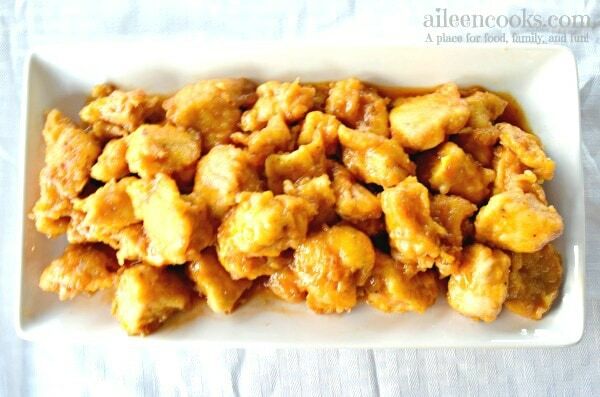 Did you try this recipe for instant pot sweet and sour chicken? Leave us a comment and rating below or tag us on social media using @aileencooks. I can’t wait to try this! We love Ling Ling, sweet and sour chicken, and Instant Pot meals. It’s like you made this recipe for me! I tried this tonight and me and my family loved it!! I was a little worried about doing cornstarch instead of flour and dredging the chicken in egg before the cornstarch instead of the other way around–i was worried it would make it seem like chicken surrounded by scrambled eggs. But my worries were unfounded and it tasted like takeout for way cheaper. Something that’s nice about this recipe is that it uses pantry staples. I didn’t know what I would be making for dinner at 4pm, but was able to pull this off without going to the grocery store. My husband said 3x: “this is so good!”. So thanks! Made this tonight. Very good. We added pineapple tidbits & orange bell pepper to it! Would love a way to cook rice in too instead of separately.